While the vast majority of our customers use our manual deployment process, automated (push) deployment is always an option when you require greater control and less hands-on user involvement. We facilitate this process by providing all of your completed email signature files in an organized and very easy-to-use fashion. 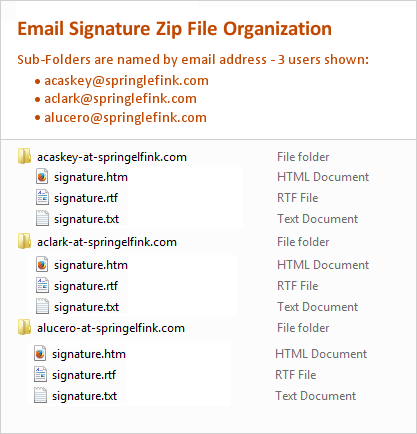 This is via a URL you can use any time to download a ZIP file containing the up-to-date email signature files each user. To see exactly how this works, here’s a link to a zipped collection of sample signature files for 57 users. While we do not directly support the scripted push deployment process, we have a number of customers who have used Windows PowerShell - based scripts with no apparent difficulty to push the deployment of the signature files we provide. Note: Our zip downloads can be run with date-stamp parameters, /12 (for half a day), /24 (for one day), etc. This enables the downloading of only recently modified files, allowing the easy creation of a routinely running script designed to grab updated files and push them out, thus keeping signatures current for an entire firm. Combined with user-driven edits and updates via our simple online form, this becomes a super slick process for managing an email signature program of any size. Note: This push-deployment script has been developed by a subcontractor - Empowered Systems Solutions. As written, the script will need minor tweaking in order to fit the specific environment of most end-users. The supporting documentation has been developed to assist in this process. Should technical support be required, it will be provided by Joe Warren, the script’s author and the owner of Empowered Systems Solutions. This support can be arranged initially through us. There may or may not be a charge to you, depending upon the scope of the agreement we have entered into with you.